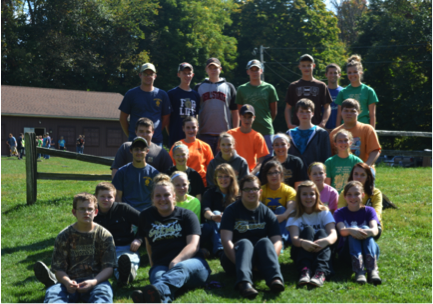 At Greenhand camp the freshmen who are in FFA went to Camp Conger where Monroeville, Mapleton, and Upper Sandusky also joined our FFA chapter. All the kids learned about how to work with one another. We also ate some amazing food cooked by Mr. Lucha and Miles Burton. Robert Gannett and Aaron Gates, who used to be our District two Presidents, came and to help teach the greenhands about Official Dress and different leadership skills and goals to have for ourselves. Bethany Lortcher and Madison Ott showed a video by Sam Glenn and that was about how to relax and have humor. The kids really enjoyed his humor and laughed the entire time. The FFA Olympics were a blast; each game involved everyone so no one was left out. All of the kids who attended Greenhand camp said they had a blast and plan on attending in the future.